Searching for a bottom with a light powered by hope. The Nasdaq has now recouped all of its losses for the year while the Dow and the S&P still flirt with double digit losses. Not surprising. The Nasdaq is not encumbered with financial stocks or big industrial dinosaurs. Plus, the Nasdaq is home to technology which is inherently driven by hope. So, as the bear market drags on, hope occasionally springs forth with ebullient rallies that suggest the light at the end of the tunnel is approaching and we are yet to hear a diesel train horn. Let's just buy stocks until we do. Maybe Obama is right. If he is, then Bush was right. If so, then so too was Greenspan. Logically, then so too is Geithner and Bernanke. They all are cut from the same cloth. Or should I say, they subscribe to the same school of the Monetary Printing Press Can Save All Of Us. The Fed is busy dumping dollars into the economy like at no time in our history. Greenspan started it. Bernanke is following through. Obama endorses it. And oddly, all the Obama supporters that wanted 'change' have gotten nothing but the same. This is not a political statement. This is just an observation. While Obama likes to think that 'we inherited a mess', citizens must understand and remember that 'we' were in the Congress that helped to create the 'mess' through ignorance and stupidity. Now, that same ignorance and stupidity is given the confidence of the citizens to solve the problems resulting from ignorance and stupidity. Printing money is not the solution. Capitalism is. A small grocery chain in the Carolinas announced their declaration of bankruptcy this past week. No, they are not going out of business. No, they are not firing a bunch of people. They are going to continue to operate while reorganizing under bankruptcy protection. Many companies have done this over time and some very large and very vital to our economy companies like airlines have taken this path. It makes one wonder, then, why we allow bankers like the Federal Reserve to take over and run our country under very different rules. The new government has imposed a 'too big to fail' rule that really amounts to 'how does it impact us' as a central bank rule in determining which companies are actually allowed to declare bankruptcy. The little grocery chain with less than 300 stores doesn't really affect the Fed so they can go bankrupt or go completely out of business and the Fed doesn't care. AIG, the big insurer, however, could dent the Fed's balance sheet and poop where the Fed runs their '3 - Card Monty' con game and that is not allowed. It's the derivatives, you know. They have to be saved. All of the big banks fall into this category. All of the big insurance companies fall into this category. This is pick and choose time. This is not capitalism. While the citizens of the country whine about having their money stolen by the bankers in charge who then reward leaders of 'too big to fail' companies for slamming their companies into the brick wall of failure, they are far too ignorant to challenge the culprits of such decisions. Certainly our new government cannot allow their cherished friends of AIG to wallow in the cavernous cesspool of bankruptcy with peons of the grocery business. This is the new 'elitism'. This is the 'change' that so many 'maroons' (in the words of Bugs Bunny) voted for. And so, the stock market pitches and rolls with every news release of governmental interventionism. Meanwhile, the world is grumbling about such antics and instances of outrageous unfairness. Saving big bankrupt companies is far more expensive than allowing capitalism to work freely. Under bankruptcy, the companies could and mostly would continue to operate while restructuring debt. They would cut costs and likely have to do away with corporate jets, multi-million dollar executive office renovations, and multi-million dollar bonuses for incompetent executives. However, since the new government celebrates and condones this corporate operational behavior (it's more efficient for the executives to fly around in their corporate jets - especially if they are paid for by the tax payer), they will continue on as incompetently and inefficiently as they have in running their companies into the ground as they did in the first place. Only now, we, the tax payers, will be called upon to subsidize their incompetence and boorishly selfishly and indulgent elitism. We will keep them afloat even if the business models don't work. Welcome to 'change'. But the rest of the world knows this comes at a price that even they will be charged. The only way to do this is to print money. Lots of it. Of course, our bean counters will argue that we really aren't 'printing' money. To a degree, they are right. Only 4% or so of US currency is actually physical money. The rest is 'electronic'. This is done by debits and credits created by the Federal Reserve. The Chinese in particular are voicing debate as to whether we now need an international currency given that our printing maniacs are going to destroy the value of the multiple trillion dollar stash of US Treasuries and cash that they now hold. If this idea takes hold, the Chinese can then begin an orderly sell-off of our garbage paper and then our inflation rate will 'zimbabwe-ize'. But I do feel sorry for Mr. Obama. He is so delusional that he still thinks the US is a rich nation. He thinks we should all have health care. He thinks the new 'tent cities' of homeless people that are popping up all over the US are disgraceful for a rich nation. Poor thing. The US is not a rich nation. Rich nations don't borrow trillions of dollars every month just to pay the bills. Lenders will soon refuse. The average American is making less money as a percentage of living costs and of course, the pathological lying machine we call 'government' will never acknowledge this with a truthful inflation gauge. But the rest of the world knows what we are doing. As you can see from the chart above, the Dow is still moving higher and it is still greatly impacted by the beginning and end of every day. 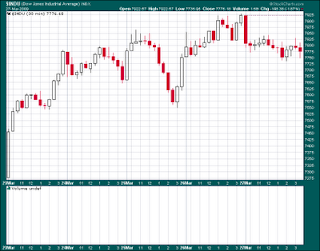 The chart is a 5-day 30-minute candlestick bar chart. Of course, it helped this week with a 200-point one-hour rally at the end of Wednesday courtesy of the PPT. I count this as a PPT rally because the 1) the Dow was falling, 2) It happened after 3PM, and 3) the rally was at a pace of over 200 points per hour. So be it. It looks like Bernanke would like to get his index over the 8000 mark to try and prove the chartists of the world wrong. Well, he has a printing press and I think he will do it. We also have to remember that our government did not want investors to get a terrible first quarter portfolio statement following such a miserable year in 2008. So, we got a terrific PPT on March 10 followed by the Fed announcement on March 18 that if our friends in China were to balk at buying our Treasury debt, then the Fed would step in with a trillion. That's just what the market wanted to hear. Rally on my friend. Just remember, this is another bear market rally and just another con game by our Fed. Treasury Secretary Geithner announced at the same time that the Treasury wanted to solicit the help of the private sector to buy up all the toxic illiquid assets on the banks' balance sheets. Really! Yes, that's their plan. I don't know if he was smoking crack when he came up with the idea but he did get it from former Treasury Secretary Paulson. I'll bet you just can't wait to buy some of those 'toxic illiquid assets' that the banks haven't been able to sell to anyone at any price in the past year. If you want a piece of the action, just get in the line labeled, 'Suckers'.